The Nation of Islam (NOI), the oldest Black Nationalist organization in the U.S., has maintained a consistent record of racism and anti-Semitism under the guise of instilling African-Americans with a sense of empowerment since its founding in the 1930s. NOI was founded in Detroit in 1930 by Fard Muhammad, who taught his followers that he was Allah personified. Upon Fard’s disappearance later that decade, his disciple Elijah Muhammad took over and promoted the idea that whites were created by an evil Black scientist and that Blacks are the superior race. Under Elijah Muhammad’s leadership, the NOI attracted a sizeable following and amassed a substantial financial empire. The group expanded in the 1950s and 1960s when Malcolm X, a charismatic speaker who joined the group in prison, became its spokesman. He denounced the group in 1964 (a year before he was assassinated), but by then NOI’s future leader, Louis Farrakhan, had joined. By the time Elijah Muhammad died in 1975, the NOI had a large following across the country. His son, Warith Deen Muhammad, inherited the leadership but steered the organization towards toward more traditional Islam. In response, Farrakhan formed a separate group to uphold Elijah Muhammad’s original separatist beliefs, taking many members—and the Nation of Islam name—with him. Under the guidance of Farrakhan, NOI has used its programs, institutions and publications to disseminate its message of hate. Despite this record, the NOI has been given a measure of legitimacy by some political and media figures. Despite formally relinquishing his leadership role in September 2006 due to illness, Farrakhan continues to speak regularly on behalf of his organization at NOI and other events around the country. His public expressions of anti-Semitism have escalated significantly since 2009, during which time he has delivered several speeches and interviews rife with conspiracy theories about Jews and Israel, and about Jewish control of government, finance and entertainment. Jews were responsible for all of this filth and degenerate behavior that Hollywood is putting out, turning men into women and women into men…. White folks are going down. And Satan is going down. And Farrakhan, by God’s grace, has pulled a cover off of that Satanic Jew, and I’m here to say your time is up, your world is through. In summer of 2010 Farrakhan joined with several African American Muslim leaders to form the Coalition of African American Muslims (CAAM). The initiative’s first major effort, a September press conference at the National Press Club in Washington, DC, was held to express support for the controversial proposed Islamic community center near Ground Zero. 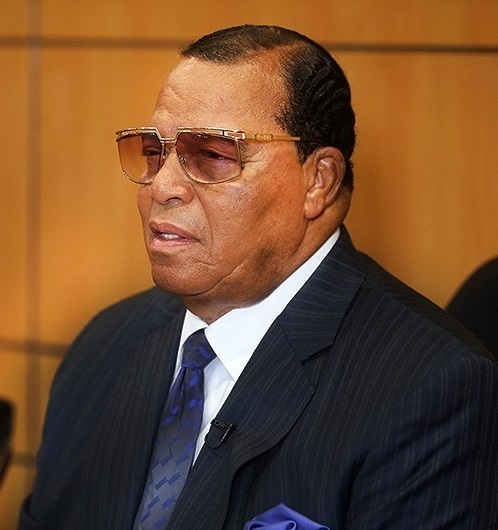 While some observers suggest that the NOI might fold if Farrakhan dies, it seems more likely that a battle for succession would develop among top ranking NOI officials. Ishmael Muhammad, Farrakhan’s assistant minister at Mosque Maryam in Chicago (and son of former NOI leader Elijah Muhammad), is among the most likely contenders for NOI leadership. Katelyn Caralle, “Louis Farrakhan: ‘Jews are my enemy,’ ‘white folks are going down,’” Washington Examiner, (February 28, 2018). Photo: Tasnim News Agency licensed under a Creative Commons Attribution 4.0 International License.